ANN ARBOR—To commemorate the life and work of Dr. Martin Luther King Jr., ISR presented part one of this year’s two-part ISR MLK symposium, “Unravel Injustice: Taking Action,” on Monday, January 21. Part one focused on our roles as citizens within our communities and featured john a. powell, the director of the Haas Institute for a Fair and Inclusive Society, and Professor of Law, African-American, and Ethnic Studies at the University of California, Berkeley, as the keynote speaker. A panel of noted citizen-activists followed the keynote address in a round-table discussion, which was moderated by National Public Radio’s Correspondent and U-M McKnight Wallace Scholar, Neda Ulaby. 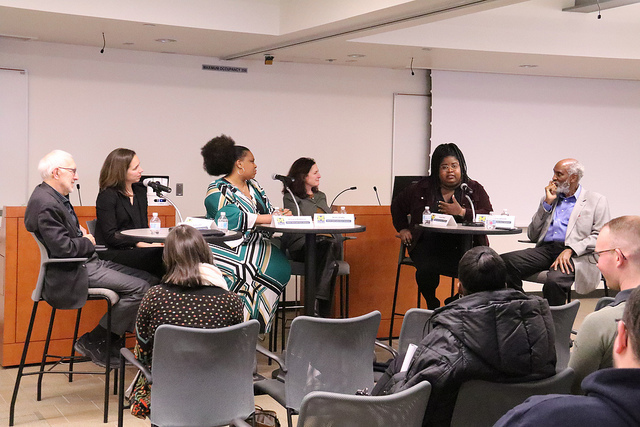 The panel discussants included citizen-activists Nick Licata, founding chair of Local Progress, Rosalie Lochner, founder of MI Support Circle, teacher-activist Jessyca Matthews from Carmen-Ainsworth High School, and Kayla Reed, founder of St. Louis Action Council. Research Assistant Professor, Maggie Hicken, gave the opening remarks, and Associate Research Scientist, Jessica Faul introduced Dr. powell. In keeping with the 2019 “Unravel” theme for the U-M Reverend Dr. Martin Luther King Jr. Symposium, part one of the “Unravel Injustice: Taking Action” discussion investigated (or unraveled) our roles as citizens in movements to create a more just and humanistic society. The keynote address opened when john a. powell shared a family tradition with the attending scholars, students, and community members: he played Stevie Wonder’s “Happy Birthday to You” in honor of Martin Luther King, Jr’s birthday. His personable, inclusive talk explored W.E.B. Dubois’ concepts of “othering and belonging,” which Dr. powell asserts are a serious problem for the twenty-first century. Dr. powell stated that while violence against the “other” is nothing new in human civilization, it is particularly pernicious in the current global and political environment. Dr. powell believes that the nation-state, with its inherent “othering,” is not the vehicle that will lead us into a society of belonging. Dr. powell made clear that “othering” is particularly harmful now because democracy is an extreme exception: only five percent of the global population live in a full democracy. He explained the increase of ethnic nationalism in this global, political situation is bound up with the concepts of “bridging” versus “breaking” in response to our increasing collective anxiety due to rapid changes in globalization, technology, environment, and demographics. After showing the video above, Dr. powell went on to unravel the complexity of “othering and belonging,” and how the process of defining who we are is also a delineation of who we are not. He points out that the lines drawn to delineate the “other” based on sexual orientation, national origin, religion, or race are inherently dehumanizing. He advocates for the “belonging” response which includes the concept that all humans and all forms of life are worthy and valuable. Powell pointed out merely stating that ‘we are all the same’ is not an adequate response and will not open the fabric of society to include a bigger version of us. As the panel discussion opened Dr. powell, Nick Licata, Rosalie Lochner, Jessyca Matthews, and Kayla Reed each told their narratives about the call to action that started them on the path of activism. The moderator, Neda Ulaby, also asked each panelist to discuss the best advice they could give the attendees about how to take action to unravel injustice. The audience had the opportunity to engage with these citizen-activists, and to hear very personal stories that transformed each of the panel members from mere citizens to activists. If you did not have the opportunity to attend part one of “Unraveling Injustice: Taking Action,” a video recording will be available soon. Photos from the event are available on ISR’s Flickr page. The second part of the program will focus on our roles within the University as one of the largest, well-known producers of knowledge – with ISR being a major producer of knowledge on social inequalities. “Social Science in the Public Interest, Action for the Public Good” is Friday, February 15, 2019. The talks will be from 1:00 p.m. to 3:00 p.m. and the round-table discussion will be from 3:15 p.m. – 4:00 p.m. in ISR Thompson conference room 1430. The keynote speaker, William Darity, Professor, School of Public Policy at Duke University will present “Moral Mondays: A New Economic Bill of Rights.” The panel discussants are the following scholar-activists: Kristie Dotson, Associate Professor, Department of Philosophy, Michigan State University, Alexes Harris, Professor, Department of Sociology, University of Washington, Mary Romero, Professor, Department of Sociology, Arizona State University, Kyle Whyte, Associate Professor, Department of Philosophy, Michigan State University, and Camille Wilson, Professor, School of Education, University of Michigan. After the keynote and brief panel presentations, each of the speakers will lead a round table discussion, facilitated by ISR’s RacismLab members, on how we can integrate action for equality into our roles as researchers and educators. Round table discussion participation is limited and available through sign up. If you would like to participate, please sign up on this Google Form.